Are There Limits to Population Growth? Perhaps the earth’s sustainable population is only half the number living on the planet today. December 30, 2014—The human population has been growing since the origin of the species homo, more than three million years ago. Modern humans developed about 200,000 years ago. The size of the population has increased during this long time span. Although it has not grown at a steady rate, the number of inhabitants of our planet has been rising. In the last century, it has increased at a faster rate than anytime during this span. In 1798, Thomas Robert Malthius, a British economist, wrote about the principle of population growth. He concluded that humans would increase in number beyond the available resources to sustain them, and when this stage was reached the population would begin to decline. Disease, famine and war would reduce the population to a size our planet could support. The basis of his conclusion? There is a limit to food, and other natural resources that are necessary to sustain the human population. This limit has become known as the carrying capacity. The carrying capacity is the upper limit of a given population which can be sustained without damage to the environment. The ultimate limit to the carrying capacity on our planet depends on photosynthesis. Photosynthesis is the ability of green plants, algae, and bacteria to convert solar energy to living organic matter. In 1968, a Stanford University biologist, Paul Ehrlich, authored a book entitled “The Population Bomb”. He illustrated the dangers of the rapidly growing population. At this time, the Earth’s population was approximately 3.5 billion. In 1972, the results of the first simulation model of the global economic system were published. The study was produced by a Futures group, known as the Club of Rome, formed from world industrial leadership by Aurio Peccei and Alexamder King. The study was titled “Limits to Growth” (Meadows, Meadows, Randers, and Behrens, 1972). There was global response to this report. By some, it was taken as a projection of doom for the earth, as we know it, by the year 2100. The report showed what the future would hold if we did not interfere with present trends. The study supported the original findings of Malthus. In spite of many attacks on “Limits to Growth”, the thesis of the book persists. No one can dispel the basic forecast presented. There is too much evidence that the prediction may eventually come true. Coupled with this is a growing, and perhaps fully warranted, fear that the human population is setting in motion forces of a scale of space and time that we can no longer control. Will Earth’s resources support our growing population? Based on this premise, the carrying capacity of Earth has limits for the human species. Studies have indicated that we may have passed the carrying capacity in the late 20th Century. While it is not possible to say exactly when this occurred, one estimate placed it in 1986. What is implied in this conclusion, is that we began consuming more than plant growth can sustain, and so environmental degradation is taking place. This degradation is now almost universal on the planet. It varies in form from place to place and varies in degree, but it is there. One study determined that we are now exceeding the carrying capacity by as much as twenty percent. There was considerable opposition to the idea of limits to population growth. First and foremost is that the population has grown to over seven billion and continues to grow. A basic criticism of the projection of a limit of growth has been that the studies did not take into consideration the growth of technology. We are no longer dependent on the natural resources for food, clothing and shelter that were available in the past. Human intelligence has been creating new resources that allow the population to grow. Proponents of economic development insist that we will be able to create new resources to support unlimited growth in the future. 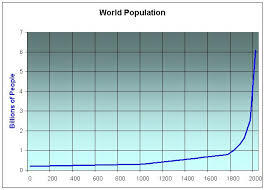 At the current time, projections are being made for our population to grow between nine and twenty billion. These large numbers are certainly possible but only with increased poverty and need by the majority of these billions. This year, it is estimated that one billion of ou existing population will suffer some stage of malnutrition, and approximately a billion will not have fresh drinking water. The important question we need to ask: What quality of life do we want for the majority of the earth’s population, and how much can we alter the natural environment and still sustain growth. That we are now altering the entire planet is clear. Does it matter? The “Sixth Extinction” by Elizbeth Kolbert, plus our currently changing climate, suggests we may be reducing the ability of the planet to sustain the population we now have. Many studies suggest that we have already grown well beyond the ultimate carry capacity. Perhaps the sustainable population is only half the number living on the planet today. Categories: Climate Change, Population, Renewable Resources | Tags: Carrying Capacity of the Earth, Climate change, Population growth, Renewable energy | Permalink.